Hall of the Mountain King: Review: Dio, "The Very Beast of Dio Vol. 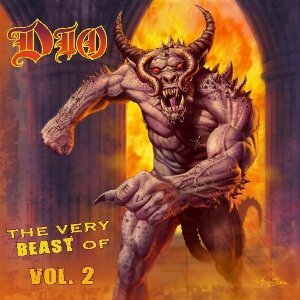 2"
Review: Dio, "The Very Beast of Dio Vol. 2"
The Very Beast of Dio Vol. 2 picks up where the first volume left off in Dio’s solo career and features tracks from 1996 onward. It’s an interesting period for me in that it features both what I consider Dio’s weakest work, 1996’s Angry Machines, and the record I consider an underrated masterpiece, 2000’s Magica. Also from the time period are two other pretty good studio albums – Killing the Dragon and Master of the Moon – and a couple of live projects, only one of which is represented here – Inferno: The Last in Live. The real attractions here for long-time fans, though, are a few rarities toward the end of the collection. The most interesting of the three is “Electra,” from the recording sessions for Magica II, the second part of an intended trilogy that the singer didn’t live to finish. Previously only available on the Tournado box set, the sound of “Electra” very much hearkens back to the first Magica album with a majestic sound and that classic Dio fantasy feel. It’s a great track that brings a little sadness along with it that we didn’t get to hear the rest of what he had planned. The second rarity is “Prisoner of Paradise,” previously only available as a bonus track on the import version of Master of the Moon. It’s not, in my opinion, one of the better songs from that record, but it’s not bad either and a boost to this collection for fans that don’t have it. The final piece is “Metal Will Never Die” from David “Rock” Feinstein’s 2010 album Bitten by the Beast. Feinstein, of course, was the guitarist for Elf and The Rods, but is also Dio’s cousin. The style of the song is a little different from Dio’s normal fare, though it does seem to be an attempt by Feinstein to write something in the vein of his cousin. The lyrics are also not what you’d expect from Dio, though, like everything he touched, he takes it and makes it his own. Even here and there when the lyrics verge on corny, Dio’s power gives them gravitas and makes you believe them because you feel that he does. That was always the power of Ronnie James Dio. With any project he latched on to, he gripped it with an iron fist and made it a Dio project. We all know how he completely transformed the sound of Black Sabbath when he stepped in, and he does the same here. The album comes in a Digipak with liner notes from famed hard rock guru Eddie Trunk and some nice artwork from Marc Sasso. I particularly like the painting beneath the CD tray, which features a new take on Dio’s classic demon mascot. Like any compilation, fans will have quibbles. Personally, I’m really missing “Challis” and “Losing My Insanity” from Magica, but then again, I’d probably include the entire Magica album, given my choice. I can’t argue with the songs they chose, either. Those things aside, it’s a pretty nice overview of the latter half of Dio’s career, including some really good records that casual fans may well have overlooked. It’s a great compilation for those folks, and of course, a must-have for completists. But I’d also recommend at least picking up the complete versions of Magica and Master of the Moon, if not all four of the studio albums represented here – even Angry Machines, because a weak Dio album is still better than a whole lot of the other stuff out there. If you don’t have these records, you’re missing out on some great music. Review: Texas Hippie Coalition, "Peacemaker"
Review: Geoff Tate, "Kings and Thieves"
Review: Chris Knight, "Little Victories"